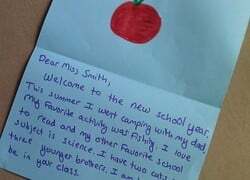 Warm up those writing skills with a back to school letter, written especially for your future self! What goals do you hope to accomplish? Don't forget to pack a to-do list in your back to school binder! This helpful checklist will inspire excellent organizational skills in your child. Get ready for the back to school season with a printable to-do list full of fall colors, a great start to an organized school year! Collect your favorite summer quotes from friends and family in this Say What? sheet. Tackle your summer schedule with a colorful, ready-to-print to do list! Your child can practise his organization skills to prepare for back to school. Springtime is here! Freshen up your spring schedule with this handy to-do list, great for helping your child stay on track with his schoolwork. Get ready for winter with this seasonal to do list, fit for the snowy season! You can help your child stay organized and keep your own schedule in check. With this summer fun checklist, your child can check off some classic summertime activities and dream up some of their own for maximum summer adventure! It's almost Christmas time! Get your child to let his holiday excitement out with this Christmas Eve writing prompt. Keep a record of friends you meet over the summer with this impromptu address book to fill with fun facts about all the friends you make this summer. List your favorite movies that came out this summer, then write your very own reviews of the best—and maybe the worst!—of the bunch. To reach goals and gain accomplishments, you have to have a plan for success. 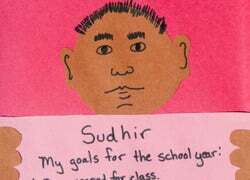 This activity will help your child to create goals for the upcoming school year. 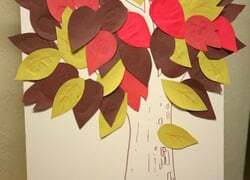 Help your kindergartener develop her fine motor and communication skills with this fun and festive fall activity. 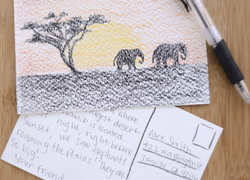 Create Awesome Apple Note Cards! 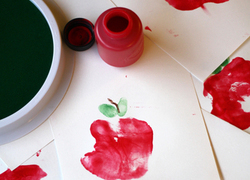 Here's an wholesome arts and crafts activity for your kid: create awesome handmade apple note cards with just some paint and blank paper!